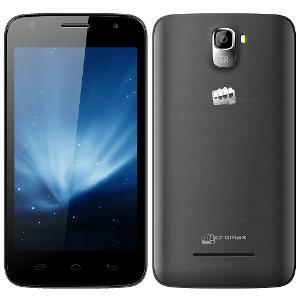 Micromax Canvas A105 has been spotted online at price of RS6999. The features and specifications of the MMX A105 are quite impressive. It comes with a 5 inch display having 480 x 800 pixels resolution. It runs on Latest Android 4.4 Kitkat operating system. Micromax Canvas Engage A091 and Unite 2 A106 are the recently launched handset which also comes with Android Kit-kat OS. The A 105 is a dual SIM phone and will compete with Karbonn Titanium S1 Plus and Videocon A29. The Micromax A105 features a 5-megapixel primary camera with flash and a VGA secondary camera for video calling. It draws the strength from 1.2GHz quad core CPU. The RAM of the phone is bit low at 512MB and internal storage is of 4GB. It is 10.5 mm thick and weighs 180 grams. The MMX A1o5 has 3G, WiFi, Bluetooth, GPS and FM radio connectivity. The battery of the phone has 1900mAh capacity to offer 150 hours of standby time and up to 5 hours of talktime. More or less but handset look resembles most of the phones in bolt series, but it would be lined up in Unit series. You can buy the A-105 from HomeShop 18 for INR 6999. Company would launch the device officially by next month, till then stay tune.